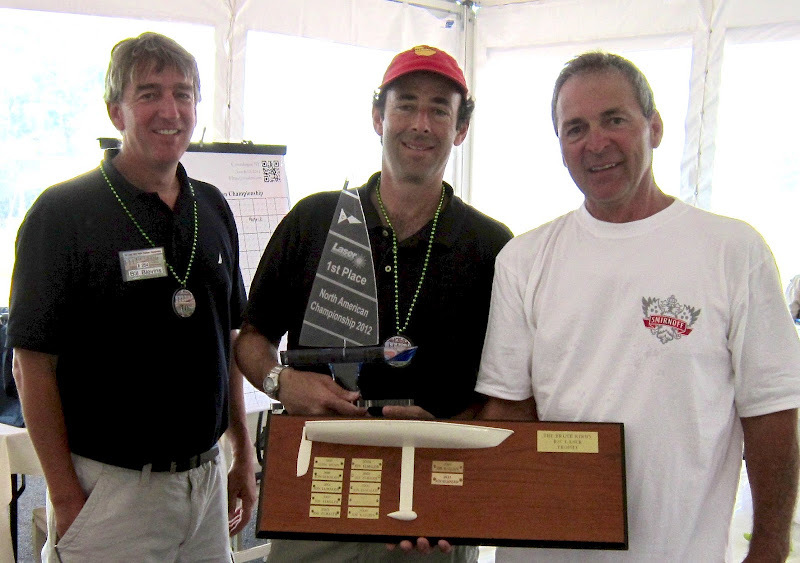 Jon Elmaleh poses with regatta chairman Bill Blevins and Nelson Habecker after being awarded the 1st place trophy for winning the 2012 RC Laser North American Championship Regatta in Canandaigua, NY on June 10 at Kershaw Park on Canandaigua Lake. 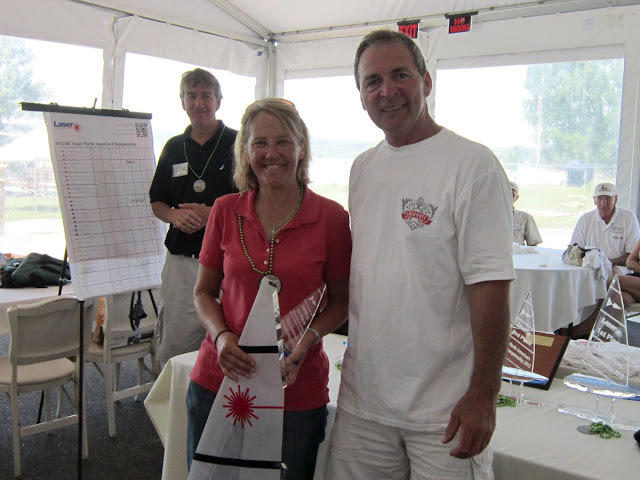 The 2012 edition of the RC Laser North American Championship was a huge success. Defending champion, Jon Elmaleh, proved his mettel as he survived fluky Sunday wind conditions to hold off Oxford’s consistent Don Barker and two finishing bullets from former champion, Jim Kaighin. 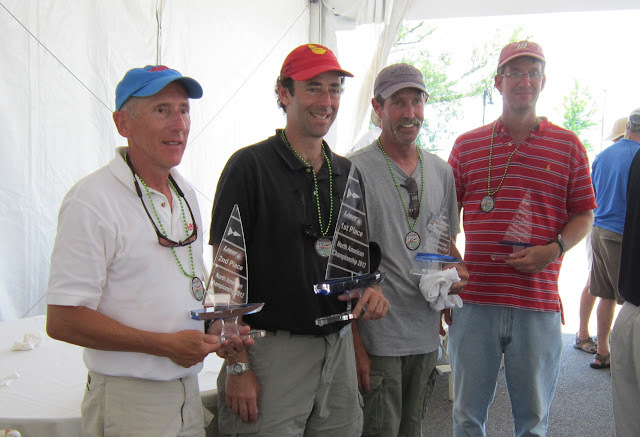 This event was the first championship hosted by the ever active Canandaigua, NY fleet and they did everything right from the opening registration to the final prize awards. All thirty skippers were greeted with a host of hospitable individuals who made sure everything went smoothly from registration to staging and assistance with boat launching to any last minute skipper needs. On Friday afternoon, the fleet was divided into three balanced teams led by our three former champions, Jon Elmaleh, from NY, Jim Kaighin from the Bahamas, and John Cleave, from the UK. After a seeding race in your group the fleet was then placed in promotion/relegation groups to begin the process. Two subsequent races were held on Friday afternoon and these scores were combined with your first race; prizes were awarded for the day based upon these three races sailed. At the end of racing on Friday, the seeding regatta results were used to place sailors in order to begin the actual championship regatta held on Saturday and Sunday. The mayor of Canandaigua, Ellen Polimeni, joined the racers for a Welcome and Happy Hour at Canandaigua Yacht Club that mixed light entertainment with lots of spirit to end a terrific first day of racing. On Saturday morning, local favorite, Jonathan Gorbold won the first race of the day. After four morning races made up of 12 heats were held, Jon Elmaleh established a six point lead over Don Barker with Philly’s, Jamey Betz in third and Pocono Pines, Bob MacNeil, in fourth. Jim Kaighin, experienced boat problems for two races on Saturday and fell to seventh even after recording two wins on the day. After racing ended on Saturday, six regatta races (18 heats) were in the bag and Jon Elmaleh, Jamie Betz, Nick Mortgu and Don Barker all recorded wins. This is a testament to the balance at the top with five different individuals winning races. NA Class Secretary, Dave Branning presenting the “Keel Bulb Award of Appreciation” to Bill Blevins for his help with the class. On Saturday evening, after cocktails, a sit down dinner was held at the Canandaigua YC with plenty of time to enjoy the company of fellow skippers. Class Secretary, Dave Branning, presented Regatta Chairman, Bill Blevins with a recognition plaque for his continued excellent work on our RC Laser NA website that is always chocked full of information. Sunday morning looked like we would have good winds but the locals predicted a dying southerly for the late morning and they were right. We experienced very light to drifter conditions for two races and called it a day at noon when the lake went glass-like. Jim Kaighin moved from 7th to 3rd with two hard fought race wins, nipping Jon Elmaleh and Don Barker in the finale. Elmaleh had led this race around all buoys and Barker came back from a terrible start, but Kaighin squeaked out the race win and Barker wiggled his way to second at the line to preserve his championship second place. Jamey Betz experienced a tough light air day moving from 3rd to 6th in the standings while the UK’s John Cleave and Manhattan’s Hank Buchanan both improved their regatta standing on Sunday moving to fourth and fifth respectively. A nice surprise in the standings was the performance of Bob MacNeill who ended up 7th with five top five race finishes. One throw out was recorded for the regatta and Jon Elmaleh kept it consistent over three days to retain the Bruce Kirby North American Championship trophy for the 8th time in twelve years. A deserving champion. Terry Schmidt captured the first place trophy and a new “D” sale for racing to the top female spot in the results for the Championship. The regatta also recorded a first with five very capable women skippers competing effectively. Winning First for the women’s category was Canandaigua’s Terry Schmidt, who spent a few races in the Blue Fleet proving her skill in a variety of conditions. 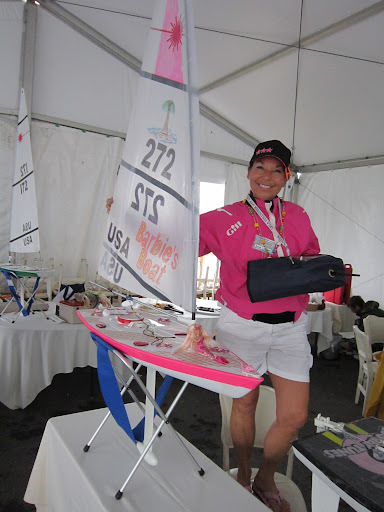 Anne Lambert getting ready to race with her Barbie Boat and matching pink jacket. Click here to view the final Championship Regatta race results. Sponsors: CYC Membership Committee, East Avenue Liquor & Wine Store, Randall Farnsworth Auto Group, Blackheart Rum (regattas need a Rum sponsor). Many thanks to the numerous volunteers that were also there through the regatta to assist as needed.